When I hear someone say this and I ask “why,” the answer is nearly always “I need to measure how much power this thing is using”. Based on this experience I have come to consider current probe use as synonymous with power measurements. Usually someone is trying to figure out how much power they are using or determine if the supply they have designed or are using is working properly and efficiently. It seems that sooner or later nearly everyone needs to make a current measurement so I thought I would share some of my experience with current probes and making current measurements (I’ve designed some current probes and have some current probe patents). My goal is to help you understand your options, what they are useful for, and what their limitations or drawbacks are. Of course, one of the most common methods for measuring current is to use a digital multimeter. 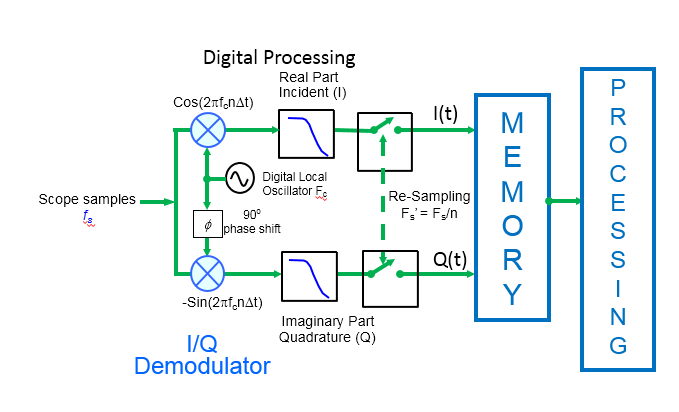 For this article we’re going to skip the DMM because you probably want to see a waveform of how the current changes over time since you are using an oscilloscope. Let’s start with a review of the types of current probes. There are two classes of measurement capabilities—AC only and AC/DC—and primarily two different measurement methods—magnetic field sensing and Ohm’s law. The most general purpose measurement is the AC/DC measurement so we’ll focus on that. When it comes to magnetic field sensing there is a wide range of options—Hall Effect sensors, transformers, Rogowski coils, giant magnetoresistance (GMR), tunnel magnetoresistance (TMR), and many more cool and exotic-sounding approaches, but the most common is to use a Hall Effect sensor teamed with an AC transformer. For the Ohm’s law approach you throw down a resistor and measure the voltage drop across it. Some people balk at the idea of inserting a resistor in series because of the voltage drop it induces. This is called the burden voltage. These same people that balk at using a current sense resistor tend to not think twice about using a DMM. What these individuals are overlooking is that a DMM inserts a sense resistor in series, usually about 1-5 Ω’s, and measures the voltage drop across the resistor. There is also the contact resistance of the connection points and the resistance of the test leads. In my experience, the DMM series resistance is about 100X greater than the resistance typically used by the Ohm’s law approach. I like to think about the two types of probes this way. If you are going to measure large current (5—100’s A) or fast current (like a switch mode power supply) then you want to use a magnetic field probe. If you need to measure small current or current in sub circuits or current in a physically small product then you want to use the Ohm’s law approach. The most ubiquitous current probe and the one you have probably used or seen is the split-core AC/DC current probe (one example is shown here). These probes use a split ferrite core—a core that has two separable pieces. Usually one part of the core slides back-and-forth or opens like scissors to allow you to clamp it around the wire in your circuit carrying the current you want to measure. The core has a series of windings around it that are connected to the internals of the current probe for measuring the current. Most probes have a negative feedback loop inside that is used to generate an opposing magnetic flux in the core to keep the core from saturating. Sandwiched inside the non-moving portion of the core is the Hall Effect sensor. The Hall Effect sensor is necessary to measure the DC portion of the signal since a transformer only works for AC. In its simplest form a Hall Effect sensor is a conducting (or semiconducting) plate with a bias current flowing along it with voltage measurement points placed perpendicular to the current path. As a magnetic field hits the plate, perpendicular to its center, the electrons flowing across the plate from the bias current tend to shift towards one side or the other, depending on the direction of the magnetic field, and create a voltage potential across the plate. The probe measures this voltage which is proportional to the strength of the magnetic field which of course is proportional to the current flowing throw the conductor being measured. There are a couple of things to be aware of when using this type of probe. First, remember back to when you were studying magnetism and current flowing through a conductor and they would always say “assume an infinitely long, straight conductor”. Well, that’s important to keep in mind. It turns out that changing the shape and position of the wire passing through the probe can change the measurement a little and this creates a repeatability problem with this type of probe. It’s usually not a big deal if you are measuring amperes of current but if you are measuring milli-amperes then it can affect the measurement. Another issue is the air gap between the two halves of the core. If you change that gap just the slightest amount, by adding side pressure or letting the probe hang on the wire you are measuring you will have repeatability issues when measuring smaller current. There is also the issue of mechanical stress on the Hall Effect element. Thermally or physically induced stress on the Hall Effect element can change its resistance or induce a piezo electric effect which will cause measurement inaccuracies. It’s always best to let the current probe warm up for 20 minutes or so before use to minimize thermal stresses. Finally there is the issue of residual magnetism. Most probes have a zero/degauss function to address this. The proper procedure then for getting the best results from you clamp-on current probe is to let it warm up, clamp it onto the unenergized wire that you want to measure, zero and degauss the probe and then energize your circuit. The Ohm’s law approach for measuring current is very popular for measuring current in sub-circuits or in targets that can’t tolerate the big long wires for the clamp-on probes (either due to size or because the long wire adds inductance and acts like an antenna picking up external noise). Traditionally folks use a pair of single-ended probes or a differential probe to measure the voltage across the current sense resistor. I am aware of one dedicated Ohm’s Law style current probe, the Keysight N2820A. This probe is a differential probe with two outputs. Each output has different gain for measuring different current ranges. The user can connect one output to the oscilloscope and choose normal or high sensitivity and the probe automatically switches which output goes to the scope. If you have a signal with a large dynamic range, like something that has a sleep state, then you hook both outputs to the oscilloscope and can view both the zoomed-in (high sensitivity) and zoomed-out (normal sensitivity) simultaneously. In this mode the probe has a dynamic range of 20,000:1. This allows simultaneous measurement of very small sleep currents and large current spikes associated with the active state. To use the probe you simply select the current sense resistor value appropriate for the current you want to measure. The probe will work with anything from 001Ω--1MΩ. You tell the oscilloscope the value of the resistor being used and the scope automatically scales and displays the results in amperes. As an example, using a .050Ω resistor the probe can measure from 100uA to 24A—assuming the resistor is rated to handle the power of the large current. Screen shot of the N2820A showing zoomed-in data (green) and zoomed-out data (yellow) simultaneously. This is from an IoT weather station. The drawback of the Ohm’s Law approach is that you need to either design in sense resistors or cut the trace and solder them in place. You’ll also need access to some current sense resistors. I usually just get mine from one of the many online component distributors. They stock a wide range of values and power ratings for various current ranges. One great thing to note about using these application specific current sense resistors is that they have very small thermal parts per million resistance variation—the resistance changes very little as the resistor heats up. If you want to dig a little deeper into what is out there just hit our website. You’ll see the full range of current probes we offer. They are of the two main types I described above, magnetic field sensing split-core AC/DC current probes and Ohms law current probes. The web pages show the important specs like maximum and minimum current, bandwidth, price and so on. You’ll also find some application notes, data sheets and videos. If you are making power measurement such as testing a power supply or measuring low power, like a battery powered device, then you should visit the Keysight oscilloscope power page.